Thomas Stephens Konknni Kendr (TSKK) is a Konknni research, educational and cultural centre named after the sixteenth century English Jesuit, Fr Thomas Stephens (1549 - 1619), a renowned linguist and Marathi poet. He came to Goa on October 24, 1579. He learned Konknni and Marathi languages so well that he wrote in them. He produced the Konknni grammar, which happens to be also the very first grammar of an Indian language to be printed in 1622. He worked in Goa for the people and their language till he died here in 1619. 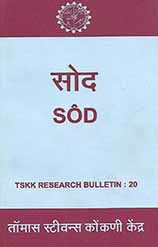 TSKK belongs to the Goa Province of the Society of Jesus (Jesuits).